I have an admission to make upfront. I’m not an athlete. Never have been. And possibly never will be. In the real sense. I mean you know the type. On the cover of Runners World magazine; rippling muscles, lean body, long strides. On Bicycling magazine, aero dynamic, serious “I mean business” look, lean, astride well-oiled machines, showing off incredible calves and toned arms. No, I am not that person. But what I lack in athleticism, I make up for in enthusiasm, curiosity and “I want to try everything” attitude! I want to be the best I can be. I don’t want to spend my life wishing I had tried (or “tri’d” for that matter). Wishing I’d done this. Or that. Or basically… wishing! 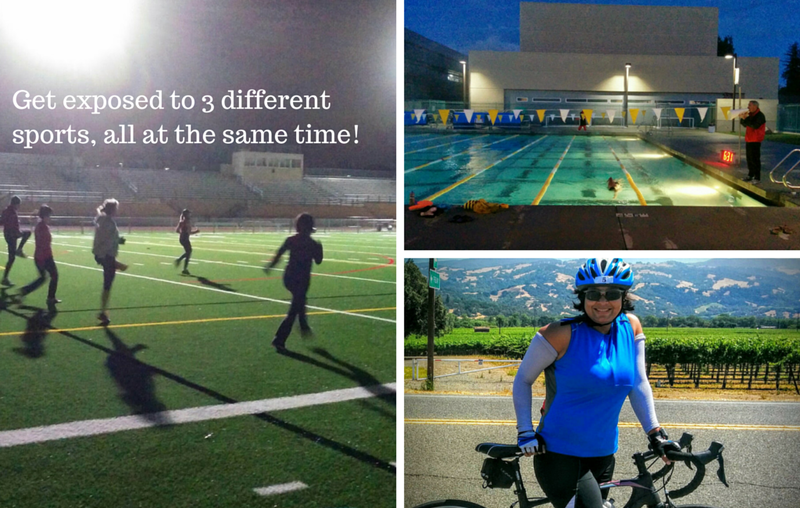 In March this year, I began training with a group to complete my first sprint triathlon on June 28. A sprint is the baby of the group, followed by longer distances like the Olympic, Half-Ironman and the Full-Ironman and other distances in between. While the distances were small, for me it was just one significant step in the journey. More than anything though, I realized a few things along the way. And I hope it’ll encourage many more of you to go out there and “tri” it out. I am an outdoors person and I discovered it a bit late in life. But I’m glad I did. I am happiest outside, soaking in all the goodness nature has to offer. Cycling and running seem like the perfect way to enjoy nature to me. While I learnt how to cycle in 2008 (I didn’t learn as a child, a long story), I began running in 2007. Once I got introduced to these sports, I started to enjoy them. Running is (and has always been) painful for me, but the exhilaration almost always follows later! I did quite a few multi-day cycle tours (Goa, Tour of the Nilgiris, Manali-Leh), quite a few half marathons (including the Auroville half, my favorite since it began in 2008, missing one only when I got injured). I realized that I’m happiest when I’m training, exercising and working towards goals. 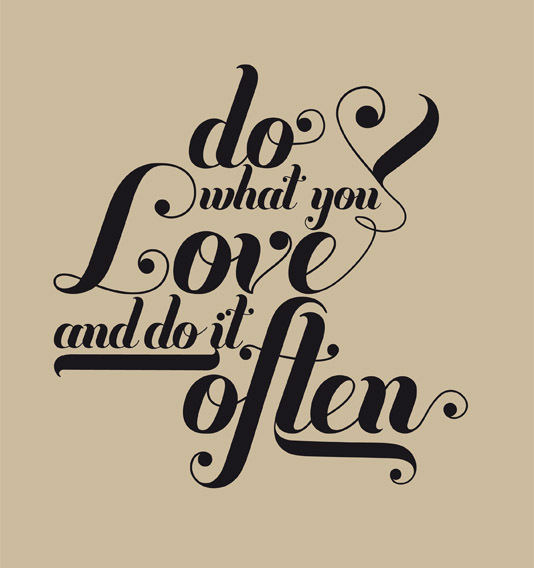 So my advice – get out there, do what you love and do it often. Some of these activities don’t start as love – but soon enough – you’ll be addicted. They’re like a drug – albeit a healthy one. So here’s the thing. I found out that it might take a lot, but you’ll survive. Unless you’re planning to do something really extreme. Like those people who jump off cliffs in body suits. I could be mistaken, of course. You can actually push yourself to limits far beyond what you think possible. A dear friend of mine, who I will call D, used to laugh off suggestions to start running – she probably never believed she could do it. But with a proper training plan and a few months of effort, she completed her first half marathon. Isn’t that commendable? I really love the training because it encourages me to push a bit harder. I’m a slow runner, medium-paced cyclist and a snail-pace swimmer. I could give turtles competition. But then, I have so much scope to improve. Like others who are peaking now, I can easily shave off nearly 20 minutes from my swim. I have so much more scope of improvement! Initially, I found the track workouts quite painful. They’re intense and my muscles were sore by the end of it. Slowly, over time, they got conditioned and I feel so much better now. They’re still intense though. 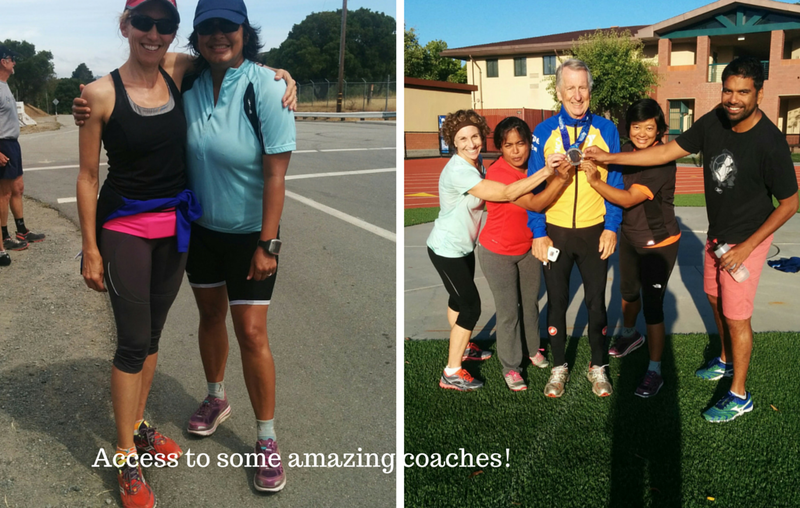 Getting access to 3 sports and 4 coaches, 6 days a week is a boon. 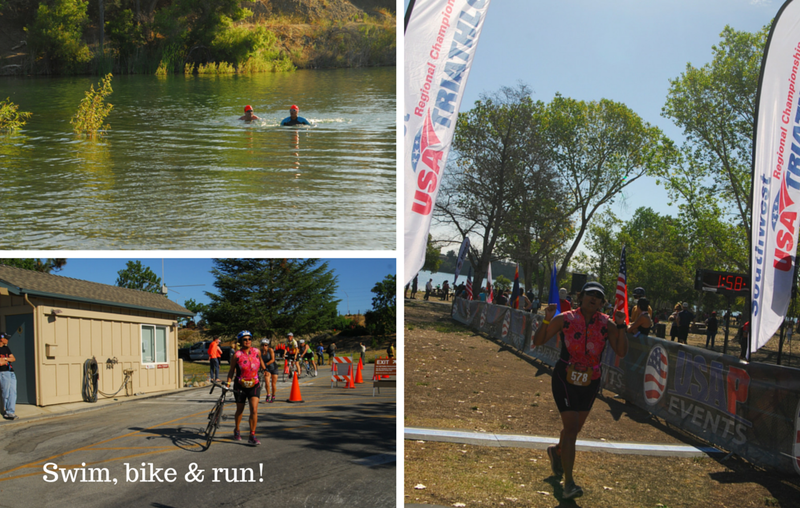 They are amazing in their own right – Coach Christy is a wonderful triathlete, Coach Dave makes it to every event and even swam the tough Alcatraz race recently (and was on the podium! ), Coach Sean beats (nearly) everyone in his age group. They’re all triathletes who are super inspiring. When I began in March as a non-swimmer, I was quite worried. Frankly, the only thing I had sleepless nights over was the swim leg. But over the months, making it to practice, I’m now able to a few lengths and not pass out. And what seemed daunting a few months ago, is suddenly more achievable. Yes – whatever doesn’t kill you, definitely makes you stronger. 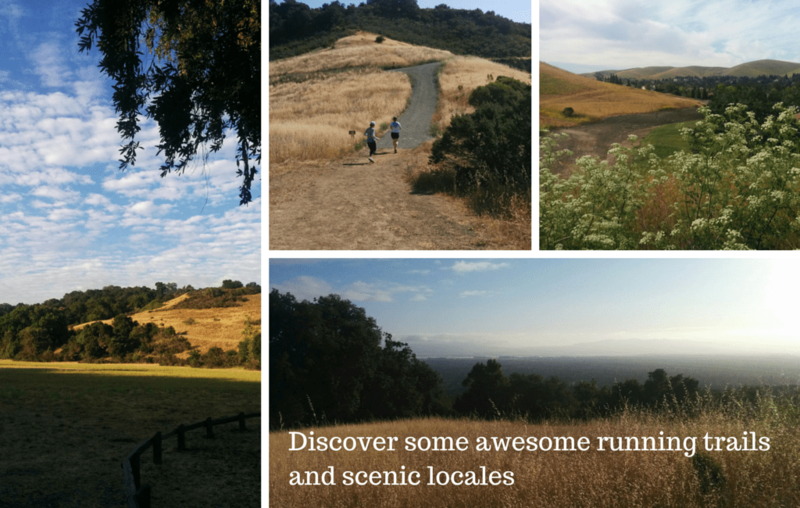 I’ve been lucky to run in some of the most beautiful trails across the countryside, from Edgewood Natural Preserve, to Shadow Cliffs, and Rancho San Antonio to Freemont Older – with the group. We’ve had the opportunity to discover some really amazing and scenic walking and running trails I would possibly not have gone to otherwise. There’s nothing quite as satisfying as a morning run in the woods, with the sunlight filtering through, lighting up the world while you soak in the cool air, and brush away the sweat! I didn’t know I’d panic in open water till I was actually in open water. So, here’s the thing. I rarely panic. I’m the calm, unflappable kind. Usually. The sight of my favorite dish, might throw me in a tizzy though. So what happened was interesting, because my first tryst with open water did not go well. I panicked. And had to be brought back to the shore. But I knew that day that I’d have to get over it. Over the following months, I had loads of support, encouragement, and help. One of the group members actually returned to open water with me to help me cope with stress, taught me how to relax and get comfortable in the water. 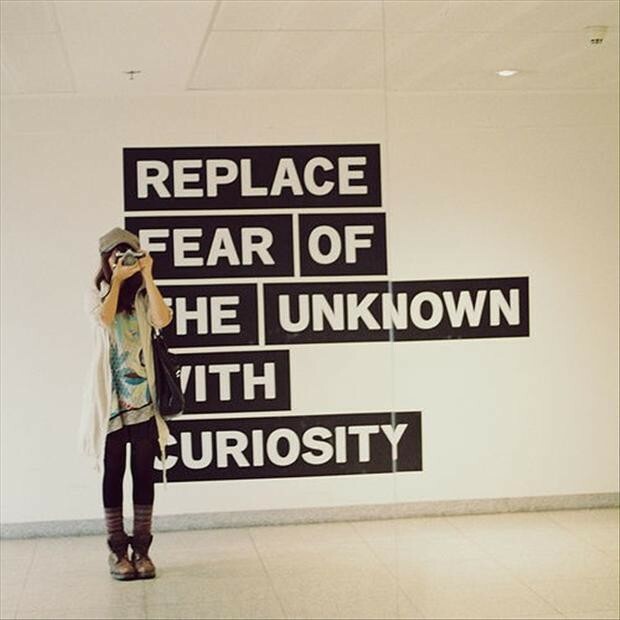 I replaced my fear with curiosity. I kept returning to that place several times till I got rid of my fear. Even during the race, I realized that I felt no panic. However, I was possibly the last one out (or towards the end). But I didn’t care much. In 3 months, I’d managed to get over my first encounter and navigate all of 750 metres of an open reservoir. Speed will come later (or one lives in hope). Builds discipline and you make new friends! The collective group dynamics works for someone like me. I must admit that I can get slightly lazy. So, having a calendar and a schedule in place is perfect. Try it out, even if you’re slightly apprehensive or are an introvert (and don’t particularly like talking to people at 5:30 a.m. in the morning). 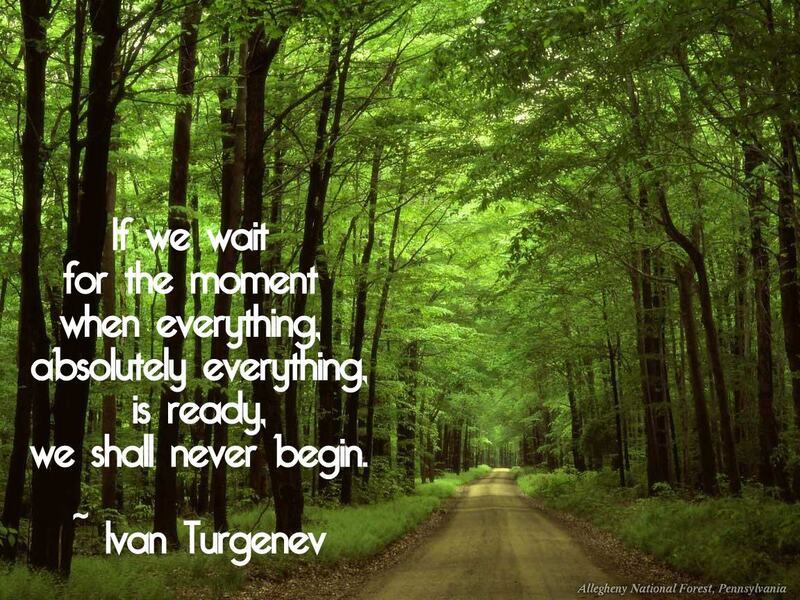 I feel it built a certain discipline in me to “show up”. And now, it happens more naturally. And of course, you’re guaranteed loads of fun. You meet like-minded people and realize everyone has their own set of challenges. When I experienced the open water panic, others shared their stories, told me that they’d had similar experiences. Everyone made sure they encouraged me. It felt like family. 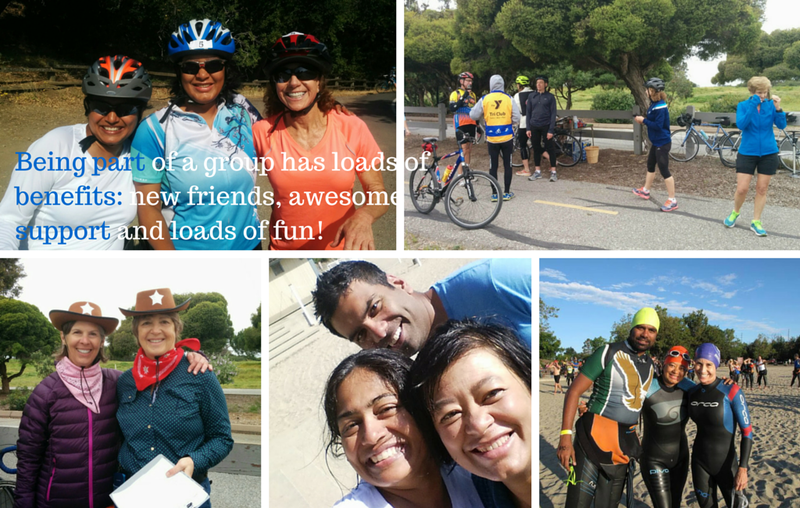 And I’ve made lots of new friends, in a new country – couldn’t have asked for more. It’s never easy to relocate, let alone in the same country; but when you move across the seven seas and have to rebuild your life, friends and a support system matters. And I’ve already got an invite to Canada, thanks to another new member who’s from there. A good deal, right? This is so important. I could compare myself to everyone else in the group and feel really bad. 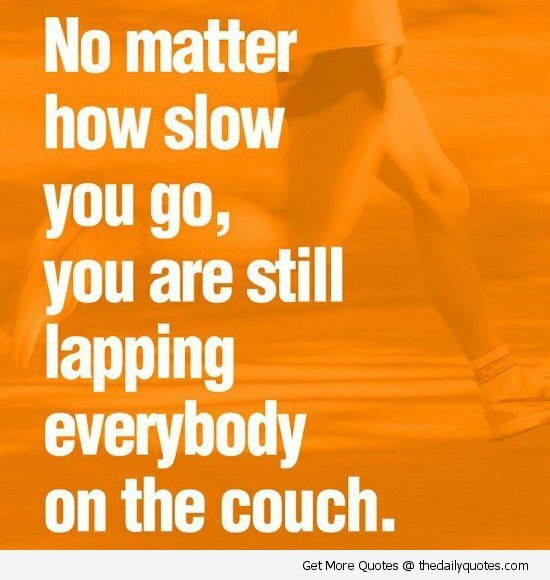 Because frankly, pretty much everyone’s faster than me. But that’s not what I choose to focus on. Instead, I look at where I came from, my background, my lack of swimming experience, my achilles tendon injury (which put me off track for nearly 2 years) and then I look at where I am. And I think that puts things in perspective. Nutrition and food are intrinsic to your training. I must admit that I am still working this important bit out. But one thing is for sure. 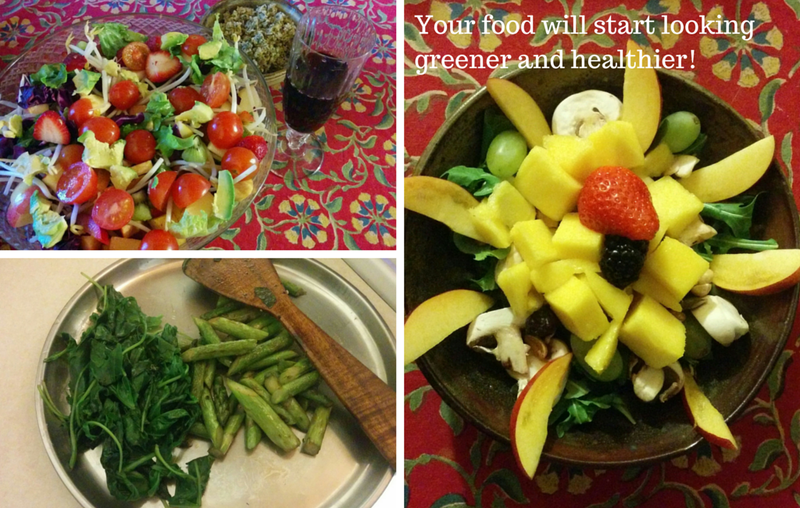 You’ll automatically start eating better food – read, wholesome and nutritious – when you start on a program. I eat less junk, I decide what’s good for my body and I’m careful about what I put in. Because input = output, right? Having said that, of course, I’m not giving up my drink of choice (wine! ), but I’m more aware of how much is good for my body. 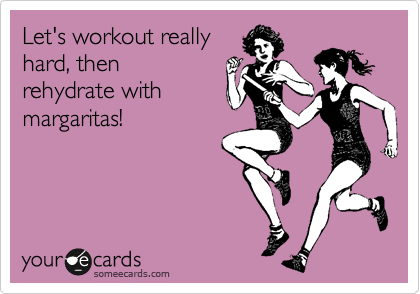 And I’ll probably won’t be guzzling those glasses before a race. Imagine being with many more of your own kind. All converging at the same location, but everyone coming out with the purpose of finishing a race. Just like you! I tried to keep calm (though it was my first time! ), not panic, and just soak it all in. I loved the atmosphere and the fact that I got to see so many athletes out there, giving it their very best. I managed my swim (taking many breaks) and trying to tell myself that I was nearly there. It still took me a what seemed like eternity in the water; 38 long minutes (most swimmers will do it in 1/2 the time or less). When I came out, it was a mixture of relief and pure satisfaction because this was the part I wasn’t sure of. For me, it was an achievement. 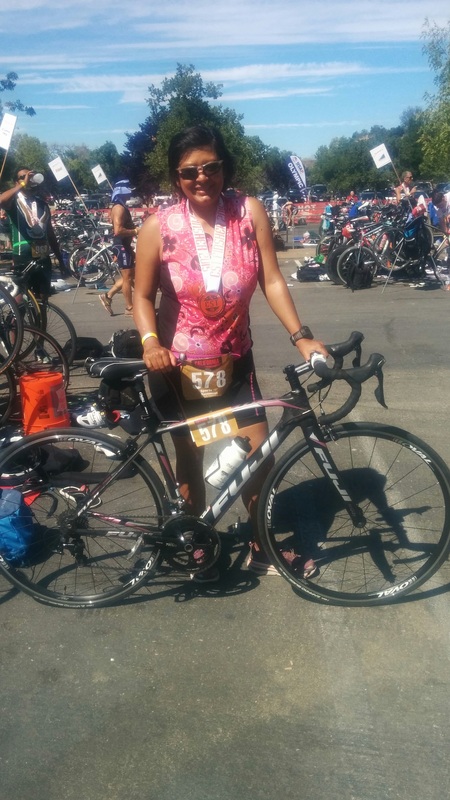 I loved the bike part, though it took some time for my legs to unlock after the swim. The run (as I was anticipating) was the toughest part. The calves hurt like crazy, the shin was not doing too well. 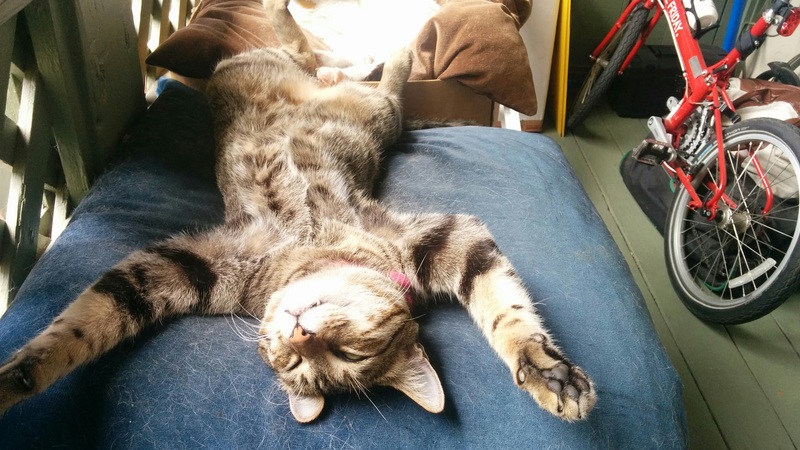 But I was not tired. Which is actually good news. It also means I need to start pushing myself harder during the swim 🙂 But for that day, I was happy. I survived! Some friends will blank out. Some will be super thrilled. Some really don’t care. But what does it matter? The satisfaction is yours to hang on to. Enough said! So what next? Work on my weak links. Get better. Get faster. Stay active. Stay focused. And continue the journey. I know I can’t make it to any podium in the very near future. But the journey itself is fun and challenging. A lovely read and lovelier pictures. Thanks Ashok! I had fun along the journey. Hopefully, it will continue! So, this bug has bit you too. Welcome, to this side of the world !! 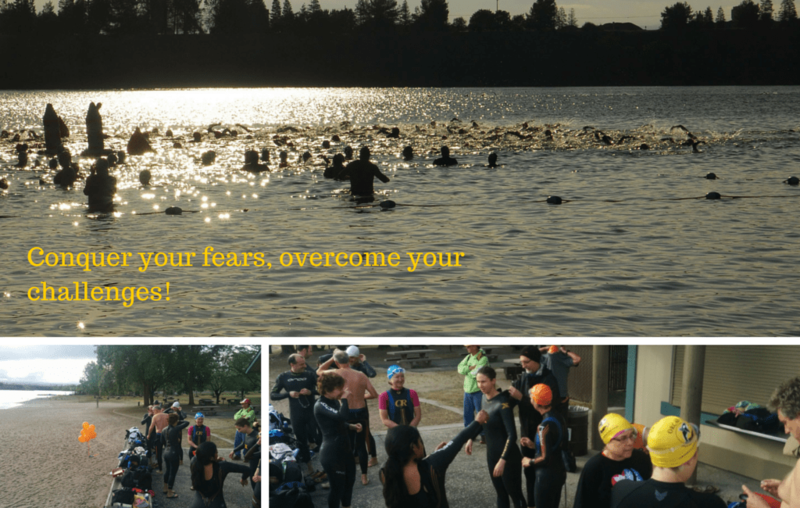 Its exhilarating to see people overcome the fear of running (for example!) 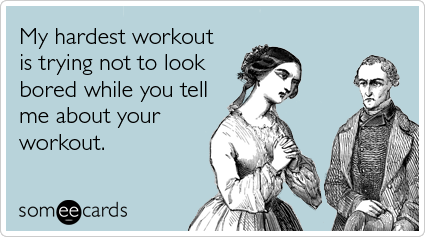 and do half-marathons with a few months of effort. I wish you would drop some names who could help train in running and swimming; there are so many of my friends who I could help. So, please, could you ? Hi Fibinse! You can go to this website http://drava.in. It’s run by friends and based in Bangalore for anyone who wants to get into running or improve!